As both remnants of and portals into the past, ruins are powerful purveyors of nostalgia, concrete reminders of the passage of time, and warnings of the inevitability of change and death. Some of the photographers in this section, such as Mark Ruwedel and Witho Worms, look at literal ruins to speak about economic greed and environmental insensitivity. Others, including Moyra Davey, Christian Marclay, and Alison Rossiter, draw inspiration from the quotidian, the obsolete, and the ephemeral. 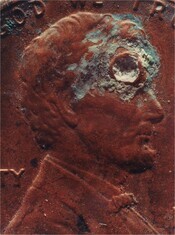 They examine material objects such as pennies, audiocassette tapes, and even photographic paper as telling markers of daily use, technological change, and neglect, revealing photography’s connection to impermanence and deterioration. Davey studies the effects of time on objects of everyday life such as old diaries, newspapers, and even the dust in her studio. 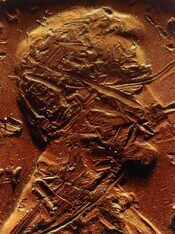 She started photographing money not long after the 1987 stock market crash. 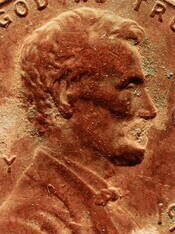 In Copperheads, a series of 100 photographs of pennies, Davey tightly focuses on the profile of Abraham Lincoln to capture the coins’ deterioration, including scratches, gouges, discoloration, and even mold. 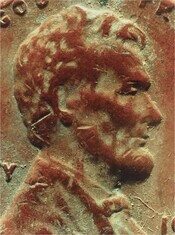 Usually depicted reverentially, Lincoln here is seen defaced, ravaged by time, and relegated to the least valuable unit of US currency, perhaps suggesting the devaluation of history itself in contemporary culture (slides 1–10). Worms' panoramic views of what at first appear to be natural hillsides are, in fact, industrial slag heaps—mounds of waste material produced by coal mining. His pictures of these manufactured landscapes document the ravages and remnants of industrialization as well as the rejuvenating forces of nature, where trees and grass implausibly grow out of the often toxic waste. 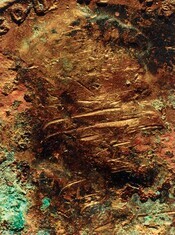 To produce these photographs, Worms traveled to industrial ruins scattered across Europe, collecting coal from each slag heap, which he then ground into pigment to make his carbon prints. 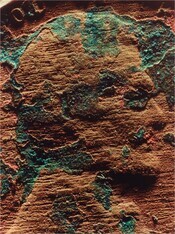 Reviving a 19th-century photographic technique, he combines subject and materials as one. 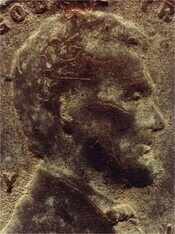 Rossiter’s pictures are created without a camera and instead use printing papers long past their expiration date. She develops them by dipping the sheets into solutions or pouring chemicals directly onto them. 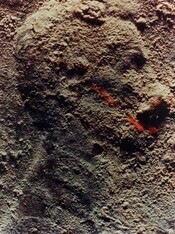 To produce these two prints, Rossiter used Kodak Azo paper that expired nearly 100 years ago. The results reveal the degradation of the paper caused by expired chemicals, light leaks, and changes in environmental conditions, but they also suggest a murky twilight landscape. The elegiac pictures mourn the passing of analog photography while offering a final glimpse of its beauty and creativity. Taken in Southern California's Antelope Valley, these photographs depict recently constructed houses that have been abandoned and left for ruins, the result of economic recession and ill-conceived suburban development. Some of the houses give no indication of the lives lived within their walls and make one question whether they were ever inhabited or even fully built; others, in contrast, show yards strewn with mattresses, cushions, a television, and broken bookshelves—the detritus of lives upended. A filmmaker and multimedia artist, Marclay explores the connections between sound recording, photography, film, and video. In 2003 he began to make cyanotype prints with audiocassette tapes, drawing together obsolete technologies from the 19th and 20th centuries. 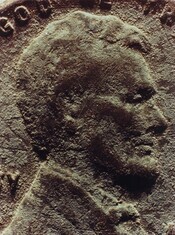 Introduced in 1842, cyanotypes are characterized by their blue tone, a result of the production of iron salts during the developing process; the heyday of audiocassette tapes was in the 1970s and 1980s. 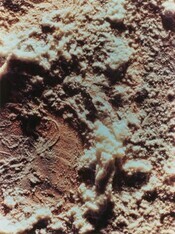 To create this work, Marclay unspooled cassettes (including A Gospel Reunion, seen in the lower left) across cyanotype paper and then exposed them to light. The unfocused composition of stretched and swirling lines recalls the allover nature of Jackson Pollock’s drip paintings, alluded to in the title, while the looping arcs reveal Marclay’s desire to visualize sound.